Hair is always one of the most important thing to complete your outfit. A nice oufit must be matched with the suitble hairstyle. However, some people don’t have time for doing their hair and choose to wear wig. So what is difirence base and sweet Lace wigs? How to put on a wig cap? This blog post help you answer the questions. 0.3 How to look natural in your wig? 0.4 How to apply sweet lace wigs to suit your dress? 0.5 What are the reasons for you to buy wig? Having been chosen by many women, Base lace wigs are easy to use and can be worn everywhere they go. Straight hair looks silky and resilient. Why you should wear base lace wig? Base lace wigs have many advantages. It’d not only add volume to straight hair but also offer chance to try straight hair for people who have curly hair. Here are some reasons you should wear base lace wig. The straight surface often reflects more light than the wavy one, and therefore it looks more shiny and silky. A smooth and silky hair gives a gorgeous look to women. Lace Wigs with straight hair would have fewer tangles and is easy to manage when it’s messy. There are definitely numerous styling options for straight hair. From a French braid to a dynamic ponytail, you can easily get the suitable hairstyle. How to combine base lace wig with your outfit? There are actually thousands of ways to combine the basw lace wig with the outift you would wear. We give you some suggestions below so you can choose the best hairstyle for your outfit. Tip: You can also add some shine serum to make your hair look healthy and smooth. We sometimes attend important and special occasions such as a wedding, birthday party or a cocktail party. An occasion where there are many people is the perfect time to take your look fashion forward. If you’re feeling so much pressure to find the hairstyle of your dreams, don’t worry. You can choose sweet lace hair which will be best for any important occasions. Why you should wear the sweet lace hair? As lace wigs are easy to use, you can get the best hairstyle you want and get a natural hair look. It makes you feel proud when everyone sees your hair, and that can improve your mood and confidence about yourself. Some hairstyles are only applied my women in a short time; after the trend, those hairstyles go out of fashion. However, sweet lace wigs are always trendy and you’ll always look fashionable wearing them. Whether a romantic look or a stylish look, sweet lace wigs suits many outfit. If you’re feeling a little funky, you can ponytail it. If you’re feeling classy, a classic red lip with vintage hairstyle. How to look natural in your wig? Wigs are used by many women, especially by celebrities. They are always seen with perfect hair with natural look. So what should they do to get it? First, you should buy good quality human hair which is the most important to a natural look. Besides, you should know how to use the lace wigs well as it can be put right to your hair. How to apply sweet lace wigs to suit your dress? What are the reasons for you to buy wig? If you want to buy A Frontal Wigs ,you should choose carefully the color of the wig. It has to match perfectly with your hair. For the ones who suffer from diseases such as cancer or hair loss, a lace wig will the best thing for them. It helps hem cover their head and give them confidence. You can use a tape measure to determine your hat size. This step is helpful because the wig supplier can offer or design you a fit wig. This is also an important step. It’s better to choose wig with color which is the same with your natural hair color. If you are experiencing hair loss, it is very helpful to cut a locke of hair for color matching to your wig. A wig with too dark color makes it unreal because there are very few people who have too dark hair color. The best color of the wig to choose is popular colors which mtaches with your skin tone. Curly and wavy hair often look more natural than Straight hair. However, the hair with the regular curls would also look unreal. To get a natual look with wig, you should use wig made from human hair and learn how to use it correctly. If you have oval face, you will look good in almost hairstyle whether it’s short or long or curly or straight. So you can choose and try whichever hair wig if you have this shape of face. Long-faced people should choose hairstyle that will make their face look shorter. Avoid thick volume of hair on top, long straight tresses along your face, especially without bangs, high ponytails or other high updos and layer-free long styles. 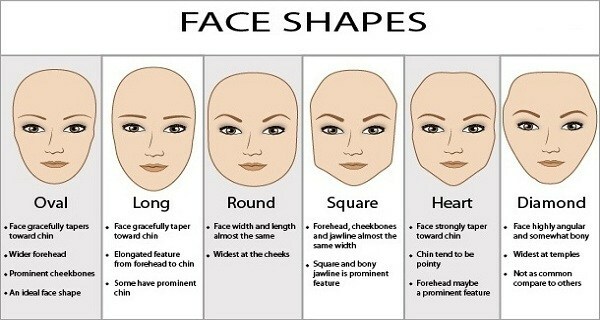 People who have round faces should choose a hairstyle which makes their face seem longer. Therefore, round faces people shouldn’t choose bob hair or too thick wig. The hairstyle for the best shape of face include long hair with a fringe, medium waves and a fringe, a bob with a fringe. Heart-shaped face is the favorite of Asian girls. People with this kind of face should have medium-length flow hairstyle, medium curl hairstyle, a side ponytail. This face shape requires the hairstyles with lots of volume and look better with short hair. Full Lace Wig vs Lace Front wig, What is better Choice? In this day and age, wigs seem crucial jewellery and play a very important role in enhancing the personal appearance of women. Layla Hair Company feels very proud of being one of the biggest collectors, manufacturers and exporters of Vietnamese hair and Cambodian hair. After gaining many experiences in this realm as wholesale Remy hair vendor and factory, we fully understand that it is important to feel comfortable in your wig. It shouldn’t feel too much tight, nor should you feel anxious about it slipping off. As you may know, wig wearers usually show a propensity for choosing a wig cap to cover their head in order to keep all their natural hair in place and as flat to the head as possible. Laylahair company specialize in manufacturing hair extension and lace closure from 100% Vietnamese Hair and Cambodian hair. Sometimes, it can be troublesome for you to put on a wig cap, especially in case your natural hair is long or too short. Have you ever faced with trouble tucking all of your long hair into your wig? Do you feel that your short hairs stick out from your wig? If your answers are YES, so why don’t you have a look at the instruction below to put on a wig cap perfectly. In today’s market, like human hair wigs, there is a variety of wig cap in order for you to choose. The material utilized to manufacture a wig cap can be nylon, cotton which engender a comfortable feeling for wearers. Nevertheless, due to the elastic and soft stuff, the wig cap cannot hold your natural hair fixedly and your hair starts peeking out from under your wig. For this reason, it is necessary to prepare your hair prior to starting to put on a wig cap. If you suffer from hair loss and make a decision to wear Wig Topper and Toupee or lace frontal closures, slightly dampen your hair as this will make it easier to manage and control. Twist longer hair up as the twisting motion will ensure fewer flyway hairs. If you have lots of hair, it may be best to create several ponytails so that it will not be too bulky. In addition, if your hair is long enough but still wear a wig or full lace closures to change your outlook, it is advisable to do pin curls. Grab a section of hair and place two fingers in the middle of the section you grab. After that, wind the hair around your two fingers keeping it as flat as possible. Then use two bobby pins and pin them in a X position. Now it is ready to put on a wig cap. Then you can install your favourite wig. If you do not satisfy with your current wigs, why don’t you have a look at Layla Hair Company Website. Layla Hair factory manufactures full lace wigs which are 100% hand tied made with single knots and very lightly bleached knots to make as natural as possible. If you are worried about how to strengthen a wig and how to style a wig. Layla Hair wigs are made of Vietnamese hair and Cambodian hair, therefore it likes your real hair and you can fell free to trim, style, dye and wash natural hair wigs. Full lace wigs are used with an almost invisible light lace that covers the top of and direct front of your hairline. Layla Hair wigs are available in body wavy, deep wavy, natural wavy, roman curly, fumi curly and loose curly. So as you can see, to improve your appearance and impress your friends as well as strangers, choose a suitable full lace wigs at Layla Hair right. Read the above instruction carefully and let dress to kill with out standing front and full lace wigs from Layla Hair Company now. Wigs are helpful, they have many adventages in our modern life. If you’re considering to buy a wig and don’t know much about it, here we will guide you how to choose the best wig for yourself. Nowadays, 360 frontal full wigs, long black wig with bangs or braid wig with baby hair can instantly alter your visual appearance and bring a great deal of flexibility in terms of hairstyle, color, and length. Maybe you are contemplating wearing a flat top wig, hair toppers for thinning hair or colored wigs in sunlight, or a 20 inch wig and good quality wigs that you can braid or curl. Perhaps you are wondering how to curl a wig, how to cut a wig or how to style a synthetic wig. But the first thing you need to understand well is how to put on a wig cap. 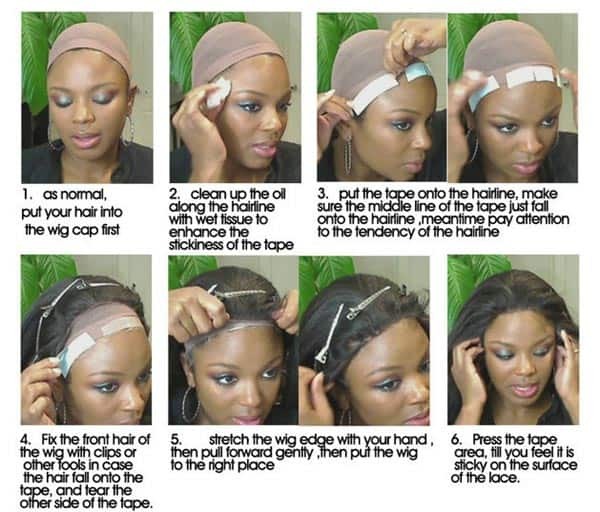 Do you know the proper way to put on a wig cap? Whether you have long hair or short hair, Layla Hair wholesale hair vendor will show you some tips and tricks to keep your wig cap and your full lace wigs securely in place. If you are new to hair wigs, free part wig and middle part human hair wig, this tutorial is absolutely an invaluable help! Layla Hair wholesale virgin hair vendor suggests you should prepare a best wig cap, a human hair wig or best human hair toppers, scalp protector and scissors before you put on a wig cap. If you are suffering from hair loss and want to wear hair toppers and best hair topper for thinning hair, the very first step when you put on a wig cap is to wash your scalp and shampoo your bio hair to make sure the application area is oil-free. Then to create a barrier between your skin and the best wig cap, let spray scalp protector directly on your head. Spraying scalp protector is especially necessary if your scalp is sensitive because a lot of wig caps, wig toppers for men and synthetic wigs in the market recently can irritate your scalp.If you have a long hair and still want to change your hairstyle by wearing 100% human hair wigs and cheap lace front wigs like curly hair wigs from Layla Hair raw Vietnamese and Cambodian hair wholesale, let do some pin curls with bobby pins. First of all, divide your own hair into a number of section. Next, grab a section of hair, place two fingers in the middle of the section you grab and wind the hair around your two fingers keeping it as flat as possible. Now use two bobby pins and pin them in a X position. Remember to lay those pin curls as flat as possible against the head in order to keep your hair looking “head shaped” and not like a “pear-shaped”. After fully pinning up, it is ready to grab your best wig cap. 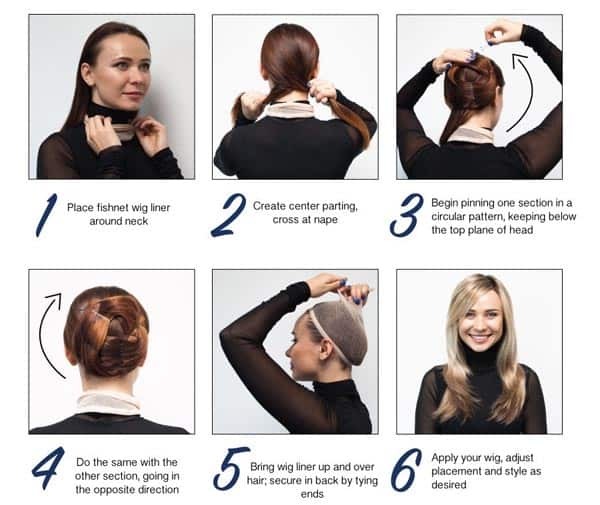 Stretch the wig cap over your head, until it sits comfortably and secures at your nape. Then tuck any existing hair up under the wig cap. If you are wearing a lace closure or lace frontal, remember your wig cap edge should be about 1/2″ back on your forehead, showing your actual hairline. This will stop your wig cap from showing through the full closure wigs and lace frontal. Layla Hair company provides lace frontal closures with Vietnamese and Cambodian Remy human hair covering along your hairline from ear to ear. They are all 100% hand tied made with single knots and very lightly bleached knots to make it natural-looking. If you intend to wear full lace human hair wigs, then trim the lace of them first. To trim the lace of your full lace wigs, use a pair of sharp scissors to trim any lace that sticks out past the wig hairline. If you want to prolong the lifespan of your best human hair wigs, keep in mind to cut just small amounts of lace, avoiding cutting too much. Leave a little bit of lace sticking out past the wig hairline, but no more than 1 inch. However, this step does not need to be done if the lace of your full lace human hair wigs has already been trimmed by the manufacturer like Layla Hair virgin hair supplier does. Be careful not to cut any of the wig hair. So now you know how to put on a wig cap properly, right? Let order some top hair pieces and best lace wigs from Layla Hair and practise those steps right now!